Bruges is a city that has been on my Dream Weekend Away list for years. 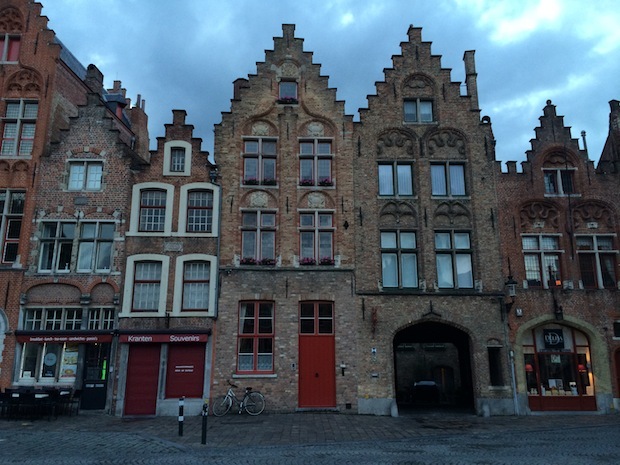 I’ve been lucky enough to visit Ghent and Ostend in Belgium and I loved them both but Bruges had slipped through my fingers a couple of times. 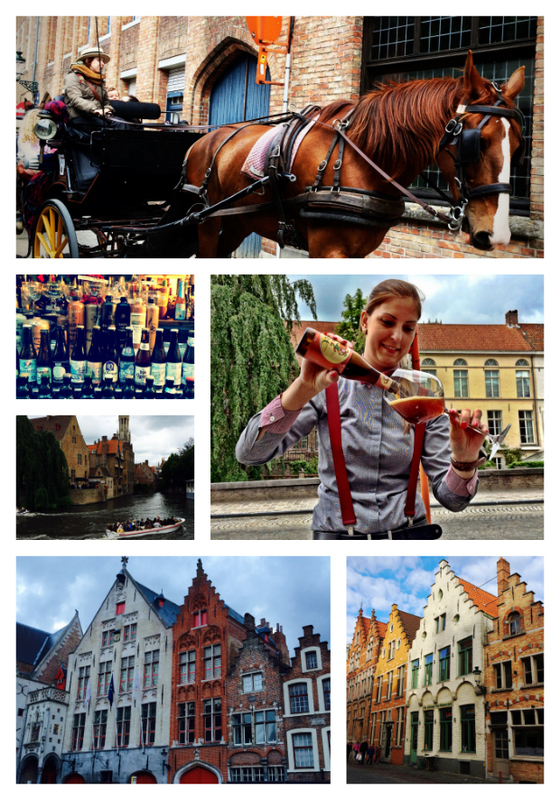 Here’s what I got up to during my weekend trip to Bruges. We flew out of Manchester on Friday at 8.30pm with Ryanair to Charleroi Airport. This was a really convenient flight because it meant we didn’t need to take any time off work or rush to the airport (perfect if you like to travel but have a 9-5 job!). Flying into Charleroi Airport was a cheaper option with flights at around £70 return. The airport is an hour from Brussels but I think the saving is worth it. To get from Charleroi Airport to the centre of Brussels you can take the Brussels City Shuttle for €14. This shuttle leaves around 20-30 minutes after a flight lands so you have just enough time to get through security and grab your luggage. You also don’t need to worry about your flight being delayed because it runs on the flight schedule rather than a bus schedule. 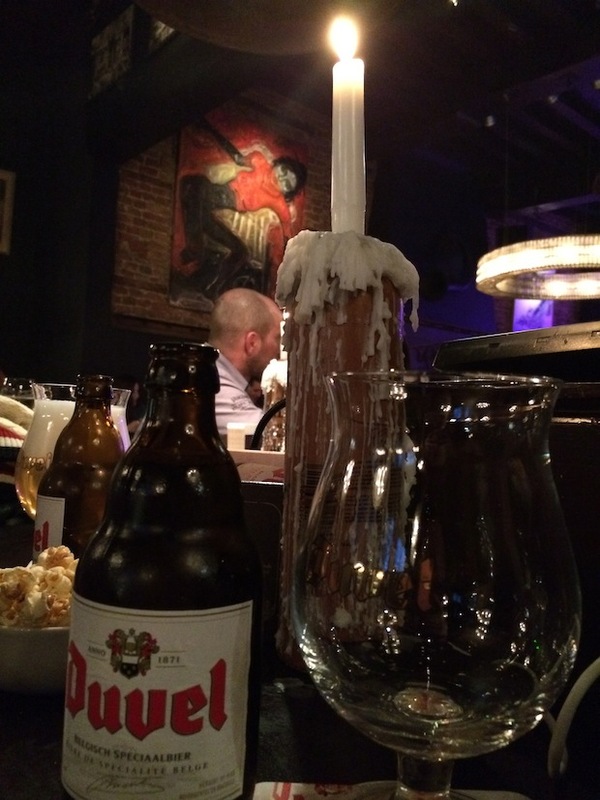 It was almost midnight by the time we arrived so we stayed in Brussels for the night at the gorgeous Pullman Hotel. This hotel is basically in the bus and train station so it’s super convenient. Our room was spacious, stylish and luxurious and we were welcomed with Belgium chocolates and beaming smiles – despite the time. Breakfast the following morning was a feast of pain au chocolat, fresh fruit and warm bread. I can’t recommend this hotel enough for convenience and cosy luxury. By 9.30am we were out of the hotel and straight onto the train to Bruges. The trains in Brussels are well-organised and simple to use. If you do get stuck, just ask one of the guards who all seem to speak English and will direct you to the correct platform. Our train tickets from Brussels Central to Bruges cost €14.10 each way and takes just under and hour. Huge wooden doors opened into a grand room with an enormous four-poster bed and a beautifully ornate and decorative ceiling. Enormous windows and a balcony looked out onto a quaint street where bicycles meandered past and flowers bloomed in every window. The fact that reception has been so plain somehow made the room seem even more special. 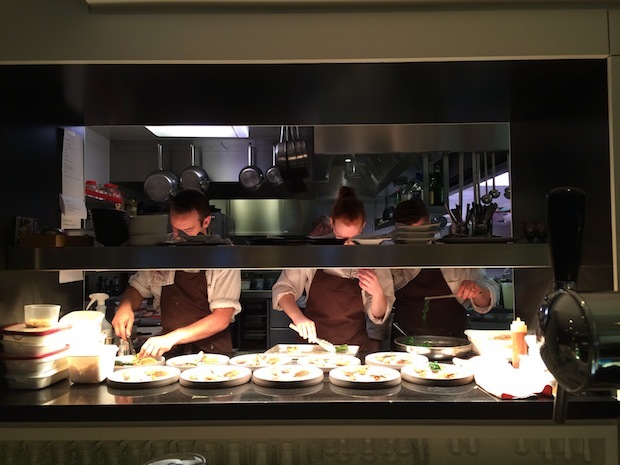 It was like a hidden gem tucked away on a side street where you’d never guess that such splendour was tucked away. Once we’d managed to tear ourselves away from the room we took to the streets for a walking tour. 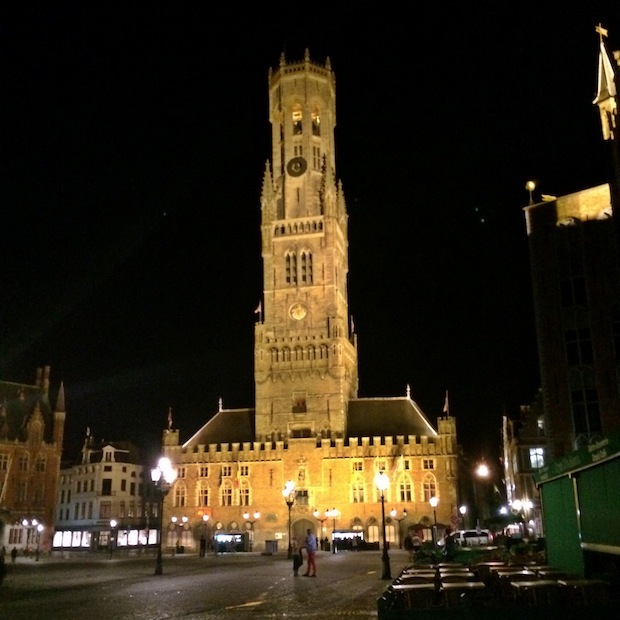 I was using this Bruges City Guide which has three walking tours you can choose from. I chose ‘Bruges, Proud World Heritage City’. While I do like to aimlessly wander and get lost in a new city, I feel like a self-guided walking tour is your best bet in Bruges. There are so many narrow, winding streets that it would be so easy to get lost or end up walking in circles. Lunch time: Have you ever seen two people more excited about chips and mayo? That evening we went for dinner at Kok-au-Vin. 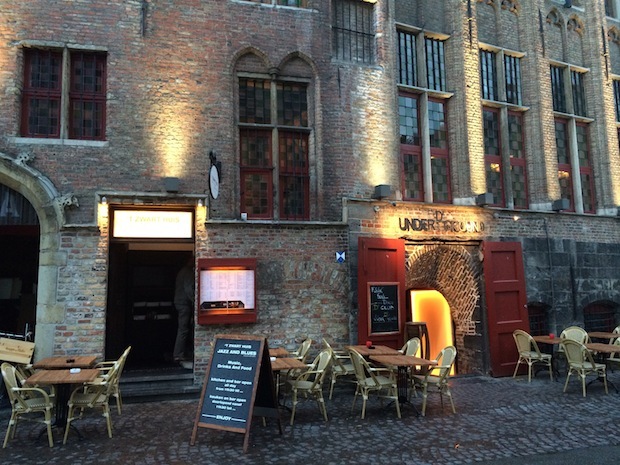 This is an amazing little restaurant and seems to be a local gem in Bruges. 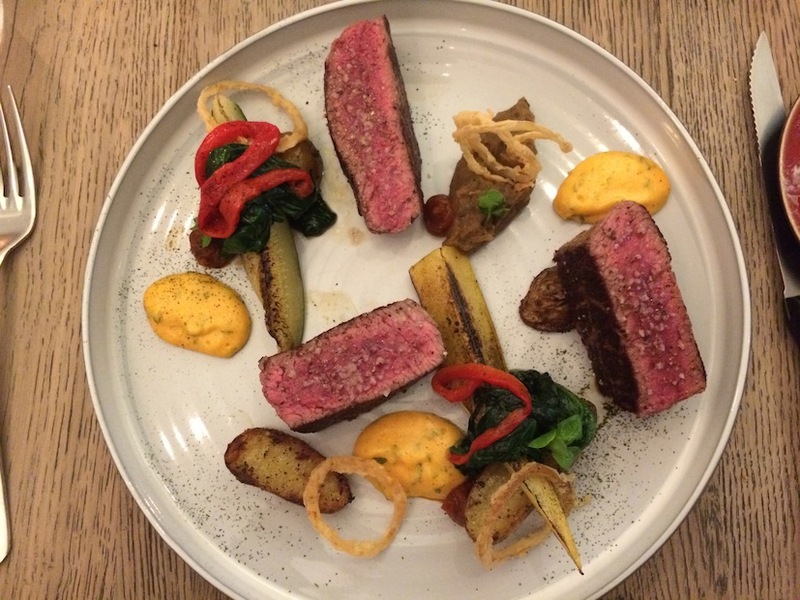 We had the tasting menu which included 4 courses and a different wine to go with each. 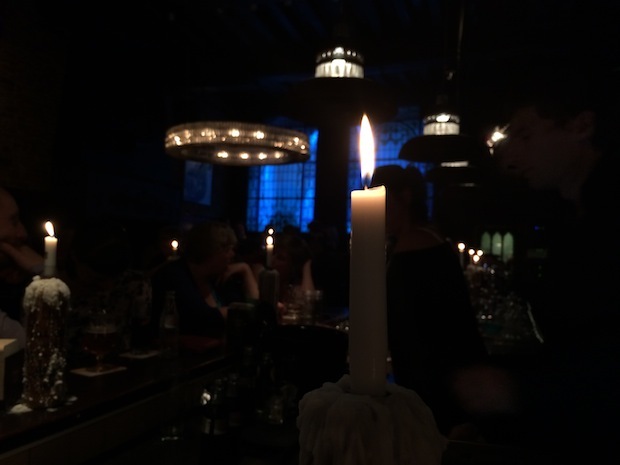 After dinner we went for drinks at Bistro Warthuis, a really cool jazz bar in an old listed building dating back to 1482. The first floor is a large but cosy bar serving food and drinks and downstairs is a lively cocktail bar. We then spent far too long trying to figure out if the Belfry is wonky. It turns out that the Belfry leans about 1 metre to the east but by this stage in the evening I’m sure we were too. 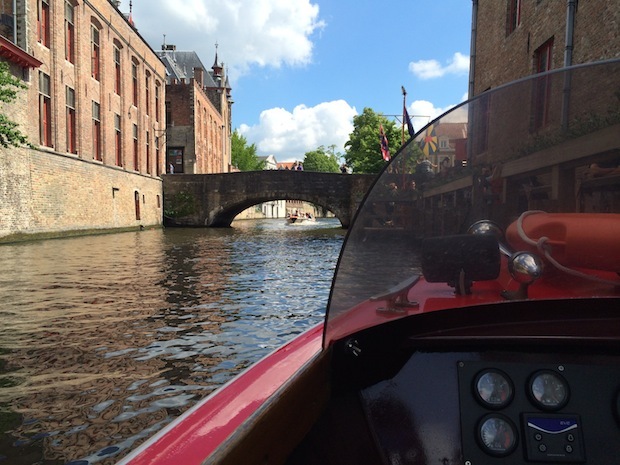 The next morning we did what ever tourist in Bruges seemed to be doing – we took a boat ride. At first we were rolling our eyes at the corniness of it but it was actually a lot of fun. 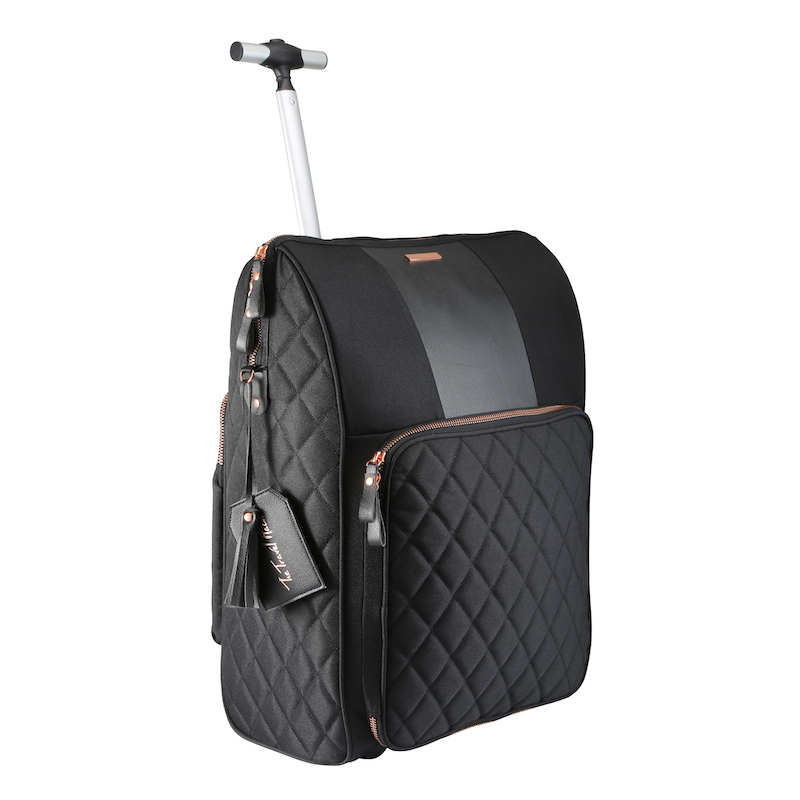 It’s a great way to see the city from a different perspective and a relaxing way to get around. 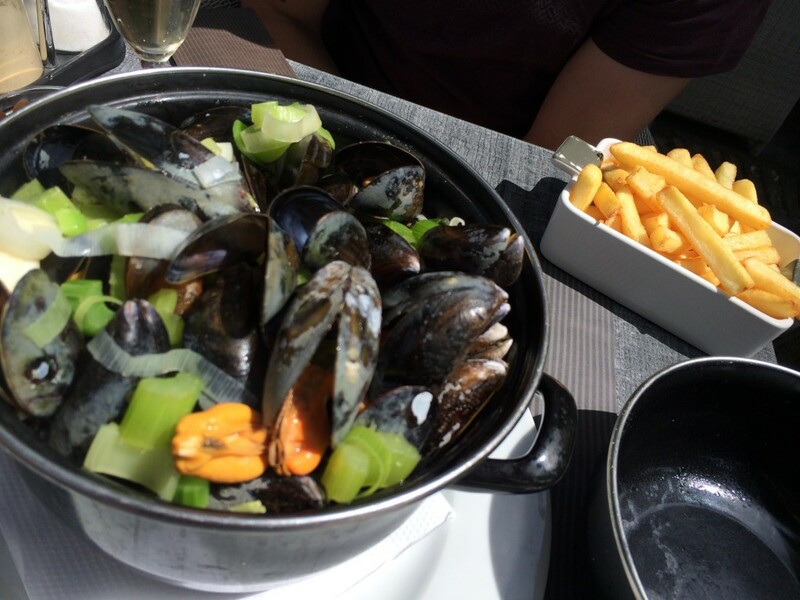 Lunch was slightly classier than the previous day with mussels and champagne enjoyed in the sunshine. Of course, we had to have those Belgium fries too. Next stop was a beer tour around De Halve Maan brewery. 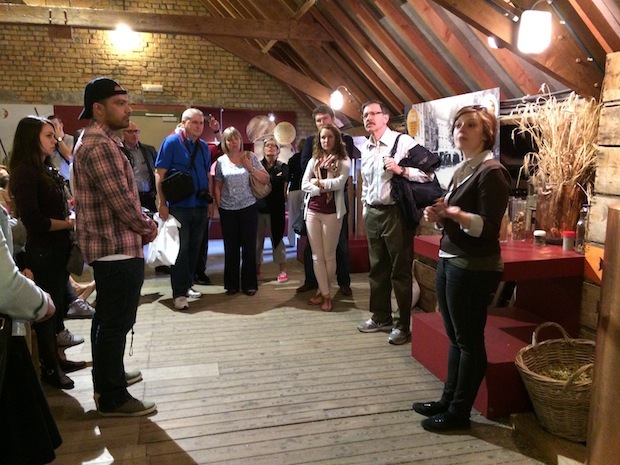 It was really interesting to find out the history of the brewery and how beer drinking has changed over the years. And, of course, there were samples to enjoy after the tour. This was the perfect stop before heading to the train station to come home. I’d like to say a massive thanks to Visit Flanders for hosting my stay in Bruges. I had such a fantastic time and can’t recommend it enough for a weekend away. I was also given a Brugge City Card which gets you in to many attractions, museums and galleries. They cost €40 for 48 hours and I used mine for the boat trip, the beer tour and the Belfry museum. 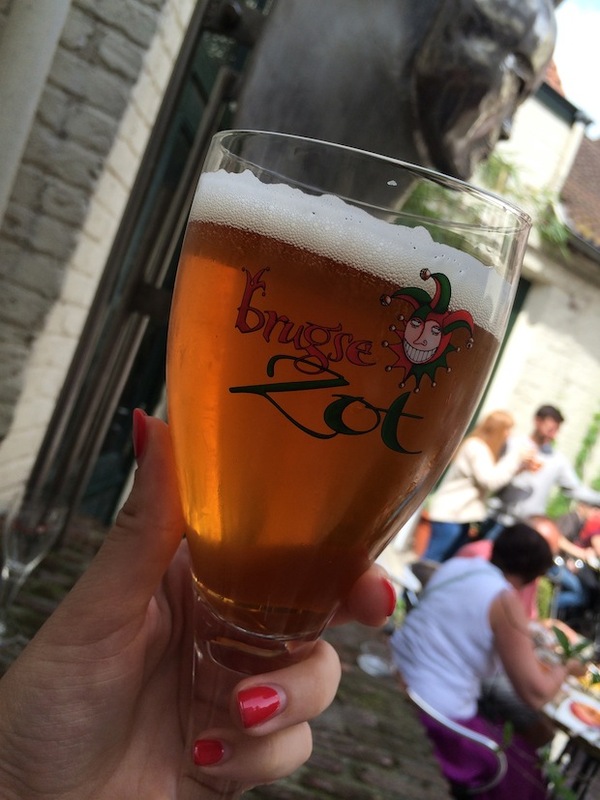 I’ve seen so many great travel blog posts about Bruges and this one’s just added to the list! 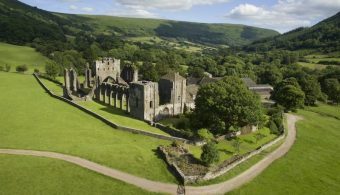 It sounds like an ideal weekend break from England – so pretty and I hear it’s lovely at Christmas time! LOVE the chips and mayo – so delicious and really one of my guilty pleasures! I love your pictures! 🙂 The architecture in Bruges is so beautiful! Really enjoyed your post! I recently visited Bruges and can highly recommend a cycle tour of this beautiful city! Really enjoyed your post! I recently visited Bruges for the first time and can highly recommend a cycle tour of this beautiful city! 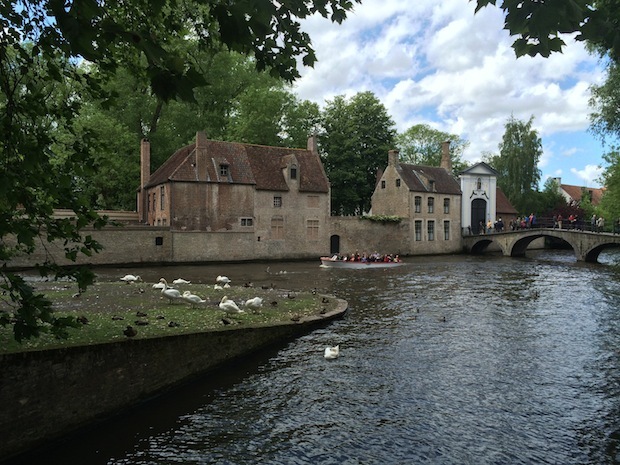 ahh, loved bruges and this post definitely encapsulates why! annnd now i want frites + belgian beer. This has been on my list for a while – but to be honest, I thought (stupidly) that you could just hop on a train there and save the Brussels bit – can you? Great post. Burges looks really awesome. Fries, mayo and beer? Where do I sign up??? I could really go for some beer and chips right now. 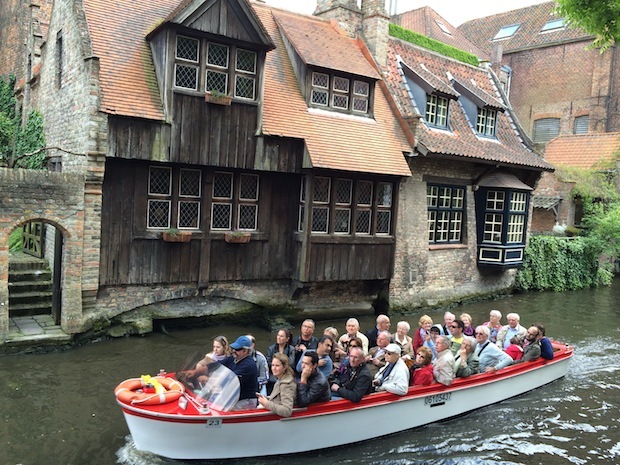 It looks like you had a blast in Bruges. We’re going to have to make it to this beautiful city in the near future! You really should if you get the chance, it’s a beautiful city. Looks like you had a dream bucket list weekend. Great way to spend a weekend away! I hope you enjoy your return trip Tim! And happy birthday! 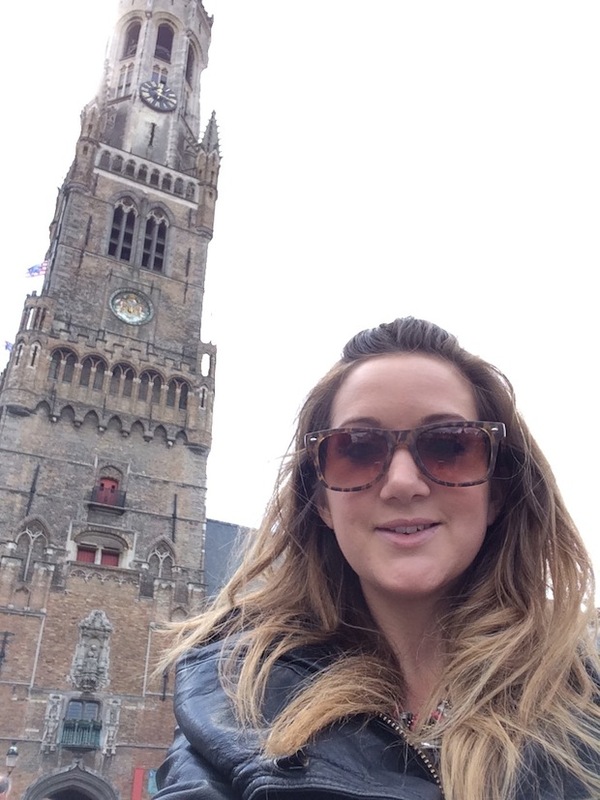 I’ve been to Bruges and I just loved it! The city is so antique and beautiful. The houses are so cute, and the beer… 😀 I visited that store where you can choose from over 1200 beers, loved it. I agree, this is a very romantic city. Bruges is an exceptional place, definitely a must see in Europe. 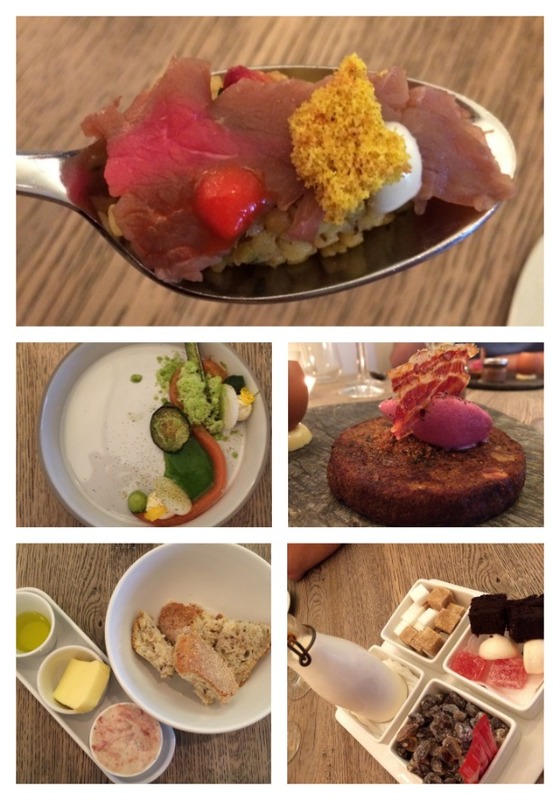 Awesome report of your trip to Bruges. I just love the city!